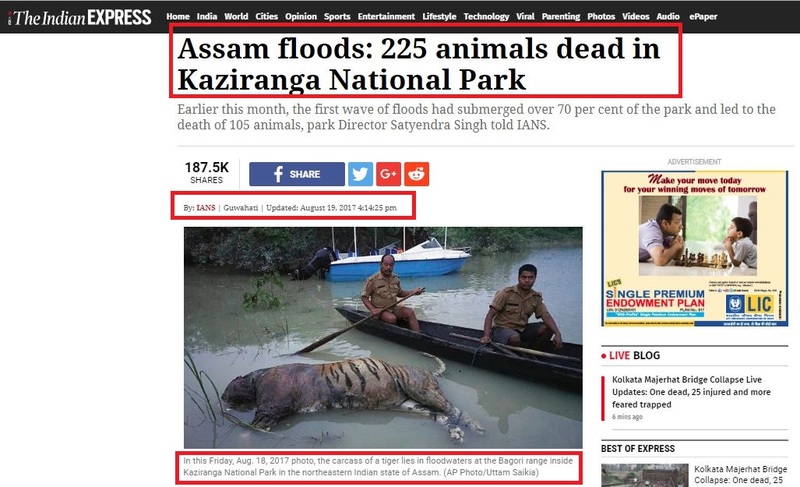 News of 225 animals dead at Kaziranga National Park due to floods in Assam is from 2017. 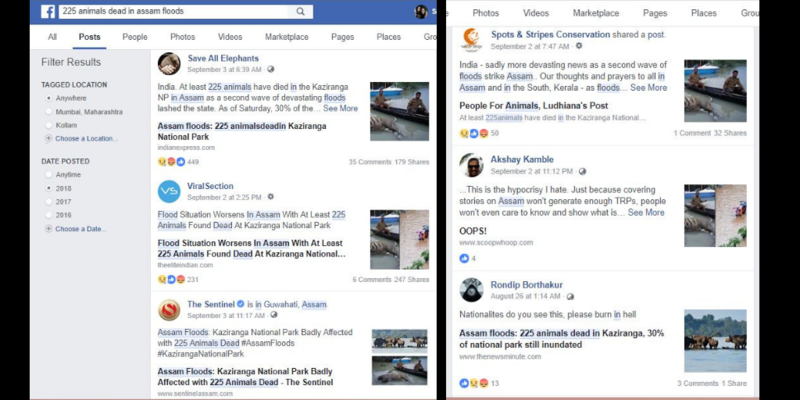 An alarming story has gone viral on social media that claims the death of 225 animals in Kaziranga National Park, Assam due to heavy floods that hit the state in the recent weeks. 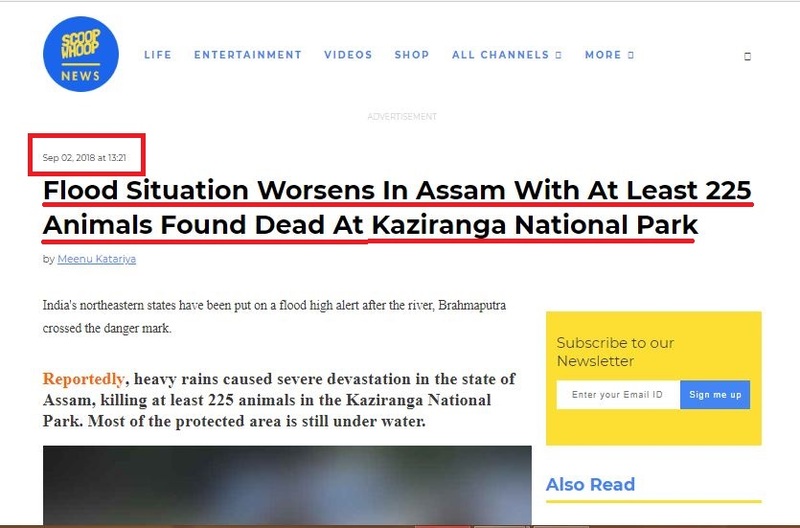 “Flood Situation Worsens In Assam With At Least 225 Animals Found Dead At Kaziranga National Park”, claims several posts on Facebook and Twitter. However, the images are from 2017. BOOM found several reports on the deaths of 225 animals due to floods from 2017. Read Indian Express, NewsMinute and The Hindu. 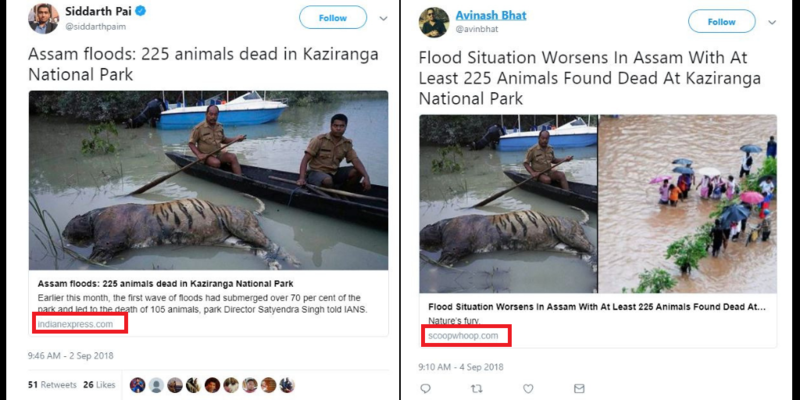 A Twitter handle also pointed out how this is old news and is giving a wrong picture about the current floods in Assam. However, it has not deterred people from sharing it. 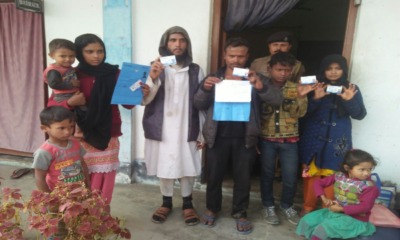 Many were expressing frustration over the lack of coverage and attention to the matters of North Eastern states. 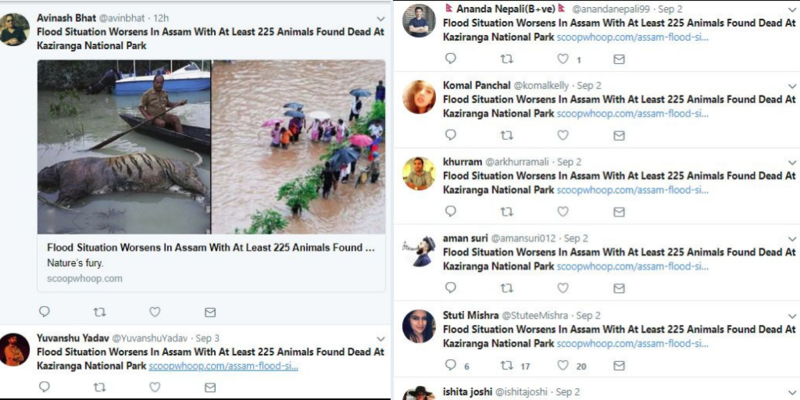 Several Twitter and Facebook users have posted the news of ‘225 animals dead in Assam floods’ over the past week. 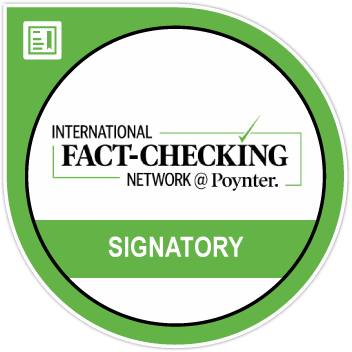 What is the source of the misinformation? 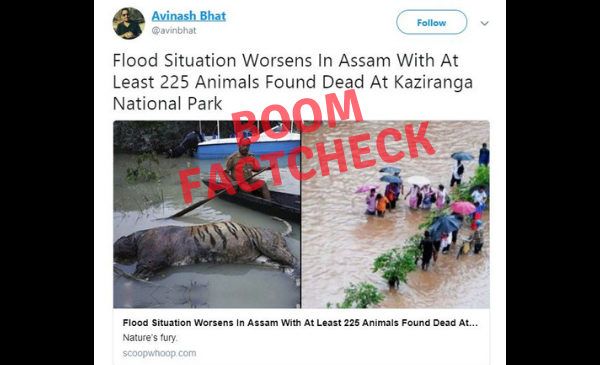 Many of the people who shared it on social media to draw attention to the Assam floods have cited articles by ScoopWhoop or the Indian Express. 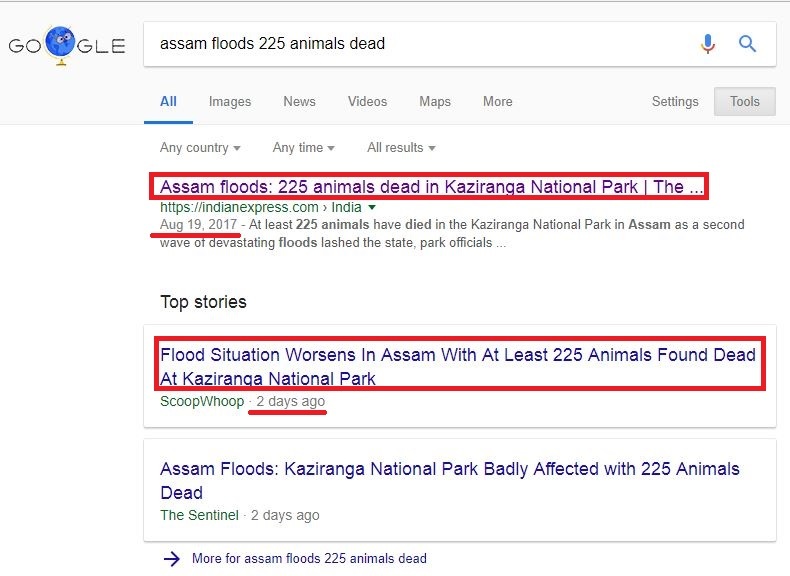 A Google search of the key words show that the Indian Express article is of 2017 and ScoopWhoop’s story was published 2 days ago. Those who have used the Indian Express article seemed to have ignored the date of publication – August 19, 2017. 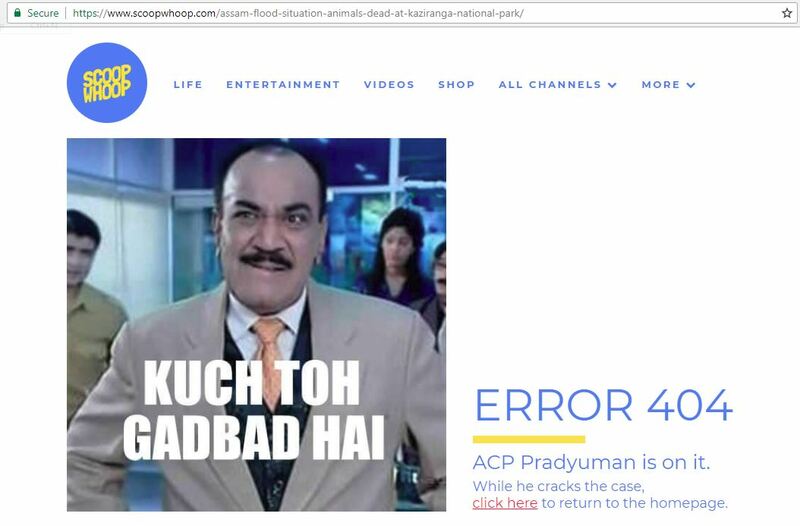 BOOM checked the link to the ScoopWhoop article, but found that the article has been removed from the site. However, we found a cached version of the article which shows that the article was published on September 2, 2018. 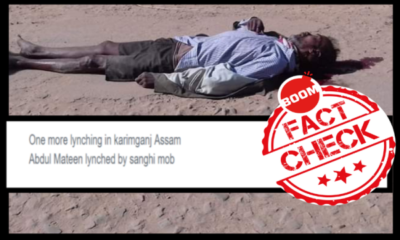 ScoopWhoop has linked the information to the Indian Express’s August 19, 2017 article without checking for the date. Click here for the archived story. 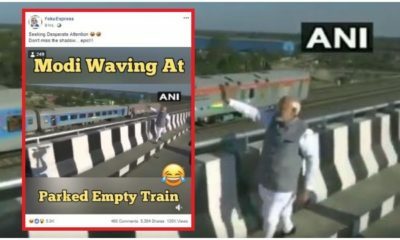 Moreover, the images used by ScoopWhoop as seen in the tweets – of the carcass of a tiger and people wading through flood waters – are also from 2017. Click here and here for the 2017 stories. Though Scoop Whoop has taken down the story, several other websites – The Little Indian , The Sentinel – carried it circulating the old news as that of 2018. Assam which faces floods every year suffers losses of Rs 200 crore annually owing to floods, reported The Times of India on September 4, 2018. Assam and Arunachal Pradesh were under alert as water levels in the Brahmaputra river and Siang River had risen, reported Mint on September 1, 2018.